John Mann MP has given an interview to the BBC on election night, in which he appears to gloat over losses in Jewish majority wards. 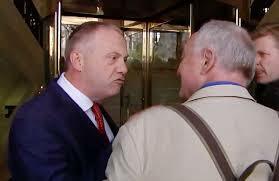 John Mann, the MP for Bassetlaw and chair of the all-party group against anti-Semitism, said the results in Jewish areas had been a “sub plot” of the night – and predicted a similar impact in London. It is clear the Jewish vote, which for generations in families has been Labour, has gone against Labour tonight. We’ve seen that Bury, in Glasgow, I think we’ll see it in parts of London. This is going to define Jeremy Corbyn’s leadership – he’s got to get on top of this because Labour is not going to win power of it doesn’t get on top of the problem. Jackie Walker has been suspended from the Labour Party on the basis of posts on her Facebook page in February in which she argued that the state of Israel cannot use the Holocaust to justify committing crimes against the people of Palestine. This information was collected by an organisation called the Israeli Advocacy Organisation and published by the pro-Israel Jewish Chronicle and passed onto the Labour Party. 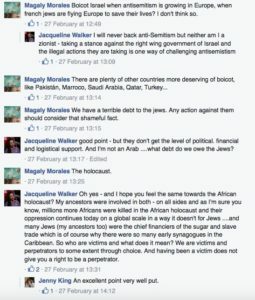 Her comments have been taken out of context but even out of context can in no way be construed as antisemitic. Jackie is of Jewish heritage and her partner is Jewish. She works tirelessly to combat racism in all its forms, and has been key in coordinating the response to the recent fascist demonstrations that have been focused on Dover. We call on you to immediately reinstate her to the Labour Party. Excerpt: ‘… Whatever the Zionists in Britain point to, as an expression of anti-Semitism, which in the main are legitimate criticism of Israel, have been said before in the last 50 years. The pro-Zionist lobby in Britain, under direct guidance from Israel, picks them up because the clear anti-Zionist stance of BDS has reached the upper echelons. They are genuinely terrified by this development. Well done the BDS movement! The reaction, one has to admit, is powerful and vicious. However, succumbing to it by suspending party members, firing student leaders and unnecessarily apologising for crimes not committed is not the right way to confront it. ‘We are in a struggle for a free and democratic Palestine and Israel: fear of Zionist intimidation is not the way forward. The coming days will be very tough and we would need to be both patient and go back to the podium, the website, the radio and television and re-explain what for many of us is obvious: Zionism is not Judaism, and anti-Zionism is not anti-Semitism. Kamel Hawwash is a British Palestinian academic and vice-chair of the Palestine Solidarity Campaign, writing in a personal capacity. Excerpt: ‘… The chief rabbi and Zionism both ask us to accept that only Jews have a right to determine where they live and never mind the impact of their demand on whoever already lives on that land. ‘In his article, Mirvis astonishingly fails to mention my people, the Palestinian people, even once. His anger with the left has unfortunately left him ignorant of our plight. ‘To the chief rabbi, we are invisible. ‘He did not once acknowledge our existence on the land, our own unshakable connection to it or that it was and still is our home – whether for those living in historic Palestine or in the diaspora. ‘We are in the diaspora because of Zionism. ‘The chief rabbi implies that we cannot disassociate Zionism from Judaism – by implication accusing all Palestinians who oppose Zionism – as indeed we do – of anti-Semitism. simply for telling the truth that her Jewish ancestors were involved in financing the Slave Trade, that the African holocaust was even worse than the Jewish holocaust, and that anti-Semitism is not a major problem in Corbyn’s Labour Party. I know what anti-Semitism is. I was brought up to learn how the Jewish East End fought with the dockers against Mosley’s fascists at Cable Street. I was told at school how it was a pity that Hitler didn’t finish off the job of murdering all Jews. And very quickly I learned what it was like to be made to feel an outsider. It was hardly surprising that I started going on anti-fascist demos in my late teens and very soon afterwards joined the Labour Party, which I remain a member of to this day. this whole saga might generate a resentment against Jews, producing the very opposite effect to that which newspapers like the JC claim they want to achieve – fomenting anti-Jewish feeling rather than combatting it. It is time to calm down, end the hysteria and restore a sense of proportion. Even if you think that the examples of Labour antisemitism that have been highlighted in the last few weeks are exaggerated, one-off incidents or simply not antisemitism at all, the controversy over these incidents may well lead to antisemitism. While antisemitism is monstrous – and, like all forms of racism, should be vigorously dealt with – false accusations of antisemitism are monstrous too. Not only are they damning, they diminish authentic occurrences, of which, sadly, there are still many. Some of these explanations are patently spurious, unfairly charging people genuinely committed to universal human rights with being antisemites because they grieve for the Palestinian plight. By abusing the charge of antisemitism, there is a danger that it could turn into a badge of honour. In a speech for Holocaust Remembrance Day on Wednesday, IDF Deputy Chief of Staff Maj. Gen. Yair Golan said that he identifies processes in Israel today that are similar to those that took place in Europe prior to the Holocaust. In a strongly worded speech uncommon for a military commander, Golan warned against trends of growing callousness and indifference towards those outside of mainstream Israeli society. He called for a “thorough consideration” of how society treats the disadvantaged and “the other” in its midst. The Holocaust, he said, must bring Israelis to “a deep reflection” of the character of man but of their character as well. “It should bring us to deeply consider the responsibility of leadership, and the quality of a society. Her contrition expressed over the past day seems to be genuine and sincere. This is part of that journey. We are optimistic that she will now take steps to deepen her understanding of Jewish identity. We do not ask or expect her to mute her criticism of the actions and policies of the Israeli government. We do ask and expect her to build upon her apology and contrition with a programme of education and action that includes standing up to anti-Semitism on the left and within the Palestine Solidarity Movement. Shah must now be their eyes and ears within the Palestine solidarity movement. The task falls to Shah, it being understood that JLM plays no role in fighting for Palestinian human rights. Having thereby attributed to Shah’s harmless historic comments a sinister import, and in doing so contributed to the media hysteria over antisemitism lurking in every dark corner of the Labour party, JLM Vice-Chair Sarah Sackman today asks the public to vote for Labour. Anyway. ‘We must stay and ﬁght inside.’ Assuming that ‘inside’ is a McCarthyite zone. We will scrutinise the inquiries into antisemitism and ensure they do not paper over the problem. We will argue for a programme of education for party officers and members and support our allies in the Party to re-shape it. This political strategy is perverse in the extreme. Much has been written about the attempt by the centre-left to destabilise the Corbyn leadership – to effect a sort of coup. But surely Jewish Labour Movement can recognise that the public now feels repulsed: either by what they perceive to be a party full of anti-Semites, or by the increasingly transparent and cynical campaign to smear it. The Labour Representation Committee wholeheartedly and unreservedly condemns all forms of racism. We further wholeheartedly and unreservedly condemn the suspension by the Labour Party of Jackie Walker – Vice Chair of the National Steering Committee of Momentum, a leading activist in Thanet Momentum, and an Executive Committee member of the LRC – for alleged anti-Semitism. The Party suspended Ms Walker after the Jewish Chronicle brought to the attention of Party officials comments made by her in Facebook posts earlier this year. ‘Many Jews (my ancestors too) were the chief financiers of the sugar and slave trade which is of course why there were so many early synagogues in the Caribbean. So who are victims and what does it mean? We are victims and perpetrators to some extent through choice,’ she said. A picture emerges of a leading pro-Israeli government organization trawling through the social media posts of Labour Party activists to brand ideas anti-Semitic when they are clearly not. The targeting of Ms Walker for remarks that have no connection to anti-Semitism suggests that senior labour movement figures, such as Unite General Secretary Len McCluskey, were right when they argued that largely baseless allegations of anti-Semitism are being used by opponents to undermine and destabilize Jeremy Corbyn’s leadership. The LRC welcomes Jeremy Corbyn’s initiative to hold a full enquiry into anti-Semitism in the Party. Any member who actually has made anti-Semitic comments must face immediate suspension pending an investigation. But there must be an immediate end to the suspension of members on a spurious basis, into which category Jackie Walker’s suspension clearly falls. Jackie Walker is a long-standing anti-racism campaigner who helped organize the defeat of UKIP leader Nigel Farage in Thanet at the 2015 election. Her suspension must be lifted immediately. We call on all labour movement activists to contact Labour Party Head Office to demand this. ‘I am writing to you in protest against the outrageous suspension of Jackie Walker from the Labour Party on spurious grounds of anti-Semitism. I call on you to reconsider this action and lift the suspension immediately’. J S-W: In today’s Prime Minister’s Questions, Cameron savaged Corbyn for having referred to Hamas and Hezbollah as his ‘friends’, and repeatedly demanded that Corbyn withdraw the remark. Norman Finkelstein—leading authority on the Israel-Palestine conflict—what are your thoughts on Cameron’s demands? Finkelstein: Does Cameron keep better company than Corbyn? Let’s look at the record. In 2006, armed hostilities broke out between Israel and Lebanon. In the course of those hostilities, Israel killed 1,200 Lebanese, of whom 1,000 (80 percent) were civilians. Hezbollah killed 160 Israelis, of whom 40 (25 percent) were civilians. If you look at the numbers, whether absolutely or relatively, who, prima facie, was the bigger war criminal? In the final 72 hours of the conflict, when the war was effectively over as the Security Council had already passed a ceasefire resolution, Israel dropped as many as four million cluster sub-munitions on South Lebanon. It was the densest use of cluster sub-munitions in the history of warfare. Entire civilian villages were saturated. It was a war crime on a mind-boggling scale. If Corbyn shouldn’t have referred to Hezbollah as his ‘friend’; and if one attaches equal value to each human life; and if war crimes are war crimes regardless of the address from which they originate—in other words, if facts rather than demagoguery serve as the basis of one’s moral calculus, wasn’t the Tory embrace of Israel incalculably worse?